So here is my story. Today my wife, 9 month old daughter, and myself set off to my in-laws for an early, 30+ people, family Christmas. Snow was so bad, 30 minutes later I'm off in a ditch. Everyone is ok, except for that stupid sign I demolished. You can see where I hit it in the pics. 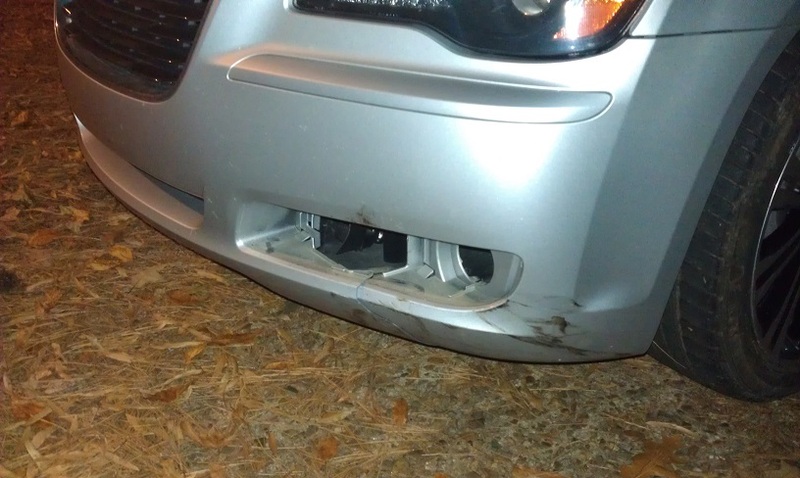 What I am wondering is how much would it cost to fix, and if it is left like this (because of lack of funds) should I expect problems further down the road? Lastly, when the nice kind stranger in the truck pulled me out of the ditch, the stupid sign was snagged/trapped underneath the body. We had to jack the car up just to pull the sign out. 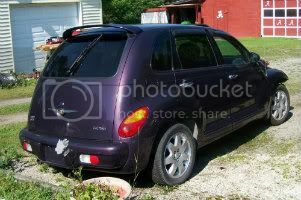 I (nervously) drove it home and then downtown to a lube shop so they can look underneath and see if anything looks off. They said I was lucky because the only damage underneath was that the frame the radiator sits on was bent down and backwards, but my radiator was in one piece (no pics of this, sorry). My last question is this, how much would that cost to fix, and if it wasn't fixed, what problems should I expect? And yes, the car drives normally, so its should be ok. No fluids were leaking either. 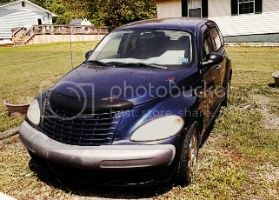 I know this is a lengthy post, but I appeal to then fans of the PT Cruiser, because if anyone should know its repair costs, it should be you guys, right? It's really not too bad.....Mainly looks like the only parts damaged are: Front Fascia(bumper cover),Air Dam,and the Foam Bumper Insert/core. If your using all new MFG parts,total is approximately $500+ (for parts ONLY!). As far as paint & installation.....That depends on how much you plan to DIY,and what rates your local body shops charge. Depending on how good you are at 'wrenching',and using 'used' parts from a local salvage yard,or even Ebay....You can save ALOT of $$$. But,they are the VERY last place I'd even consider buying ANY parts from;Their prices on some things are OK,but when you get to the S/H part,it's outrageous! Well said. There was no other car on the road when the accident happened. It was a gradual turn to the left, before I could even get to the turn I put on my brakes to slow myself down. The back end went to the left, the car went 1 o'clock right into the sign (i think it was a powerslide). Looking back, I believe I pushed to hard on the brakes. So technically, its my fault. No need to go oem here. You can go aftermarket way cheaper with free shipping as well. You can even order pre painted. Compare to local painting. I would straighten this last peace. Black mark on OEM 20-inch left front rim. With our Shelter insurance, our part was only $250. 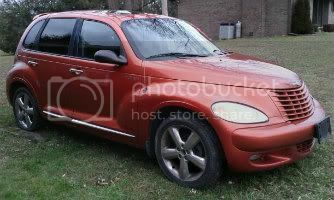 But the entire bill through the body shop at the Chrysler dealership where we bought the car new was only around $1350. That included a new OEM facia, new OEM fog light assembly and all painting and body work. Before we took it to them, I priced the parts online myself. It would have cost me half that much just to get the parts. Last edited by Handy_Cruiser; 15 Dec 2013 at 02:22 pm. My son had a "beater" car that had a lower lip hang-down like your front end - I cut a length of threaded rod and pulled it up so it wouldn't bottom. I've done this on similar cars. And it's actually pretty easy to do. I believe there are a couple of bolts on the PT bumper cover that are kind of hard to get to. Other than than, it's straight forward and you can do it right in your driveway without getting very dirty..